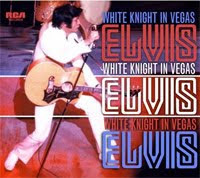 I for one applaud FTD's decision to release yet another 1969 August show, this time the dinner show from August 26, titled Elvis: White Knight In Vegas. In fact, I could use the same argumentation that I did in one of my very first posts back in August 2007, titled "I Can't Stop Loving 1969." and clowns around quite a bit (maybe too much at times). Please be advised that the forthcoming White Knight In Vegas will now be 5" digi-pack with 12 page colour booklet. We had intended to make this a special 7" but due [to] technical reasons, it won't be possible.